The book "Woman and cancer, Images of breast cancer in culture", under editing of Edyta Zierkiewicz and Alina Łysak, is a collection of essays about the acceptance of breast cancer as problem in culture. The reading offers a deep analysis of psyche of woman touched by breast cancer. 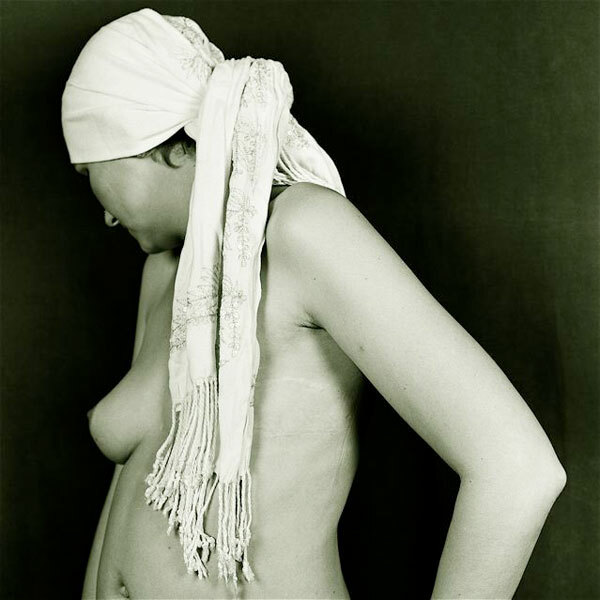 In the four subject sections ("Myths, symbols, superstitions", "Contemporary BCSs", "Art", "Media pictures"), there are essays written by many women: the ones who have experienced the illness and the one's who find the theme of breast cancer important and significant. Among them there are i.a. BCSs, artists, art historians, psychologists. While working on the book, Edyta asked me to prepare a cover photo for it and I chose to photograph Ola. Due to her professional situation of working in national administration, my model preferred to remain anonymous. She thought that the Polish society was not mature enough to face such an aesthetic challenge and she feared ridicule and persecution. In this work I was trying to uncover the scar after a mastectomy, while covering the model's face and letting Ola hide her identity. I wanted to discover what influenced her self-determination in such a significant way. In discovering her strength, Ola became for me the symbol of many women who have been afflicted by and survived breast cancer. Woman and cancer. Images of breast cancer in culture Collective work under editing of Alina Łysak and Edyta Zierkiewicz. MarMar Editor 2007, 176 pages.